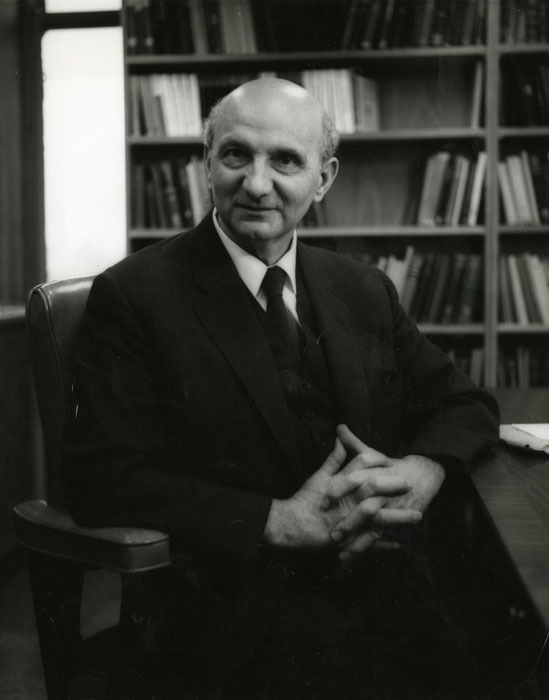 Photograph of Otto Krayer, circa 1964, by Albert R. Frederick, Jr.
At the beginning of 1965, Shields Warren, Harvard's Professor of Pathology, was placed in charge of all legal medicine activities, pending the appointment of a new Professor of Legal Medicine. The post-mortem service for the county medical examiners continued, lectures for third-year students were revised, and new research projects initiated. Despite these changes, Robert H. Ebert, the new dean of the Medical School, and President Nathan M. Pusey continued to keep a critical eye on legal medicine research and teaching and appointed a new ad hoc committee to consider candidates for the Lee Professorship and indeed the very future of legal medicine at Harvard. In an influential 1966 letter to Dean Ebert, Otto Krayer of the Department of Pharmacology and a member of the committee, analyzed the situation, stating that a professor of legal medicine should be neither a pathologist nor a toxicologist, but a lawyer−-a professor of medical law "who fixes his gaze upon the ills of the world and not for a superdetective who obtains his satisfaction from solving a case of homicide." 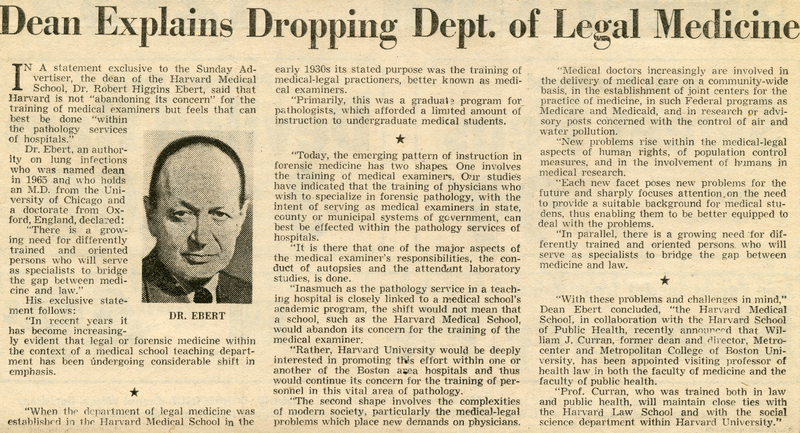 The Medical School's new dean, Robert H. Ebert, here announces the dissolution of the Department of Legal Medicine, stating that the training of medical examiners would be handled better by hospitals, and the appointment of William J. Curran, as visiting professor in health law. On June 30, 1967, Harvard's Department of Legal Medicine was phased out completely. The intention was that the future training of medical examiners would become the responsibility of the pathology departments of hospitals and a different type of individual would then be found to work in the academic disciplines of both law and medicine. The holdings of the Magrath Library were brought into the Countway Library of Medicine. The last of the seminars in homicide investigation was given at Harvard in May 1967; the program moved to Baltimore and came under the care of the Harvard Associates in Police Science. The Nutshell Studies were then loaned to the Medical Examiner's Office in Baltimore for use in the seminars. In 1968, William J. Curran (1925-1996), a legal scholar who had formerly been associated with the Department of Legal Medicine, became the Lee Professor, in a joint appointment to function as "liaison between the faculties of medicine, public health and law so that more fruitful exchanges can be made at student and faculty levels." He held that chair until 1991 and was later succeeded by Dan W. Brock. Robert D. Truog currently holds the Frances Glessner Lee Professorship and was named director of the Medical School's Center for Bioethics in 2014. "How Murderers Beat the Law"
"A Certain Feeling of Impermanence"